Suitable for interior or exterior stairways, Boldstep Glow-in-the-Dark Message Stair Tread can be made to indicate floor levels, warnings, or to guide people out of buildings in emergencies. Message is encapsulated in 2 in. glow section to ensure that it cannot be worn off and will remain visible during power outages. Available in widths from Â¾-11 in., tread is constructed with aluminum base and coated with anti-slip epoxy filler that will not trap dirt and oils. 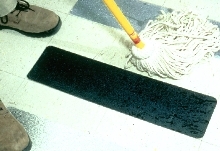 CLEVELAND, OH, March 6, 2007 - Sure-Foot® Industries' new Boldstep Glow-in-the-Dark Message Stair Tread meets or exceeds several industry standards, further supporting the company's leadership position in the safety floor covering business. that it cannot be worn off and will remain visible in power outages. 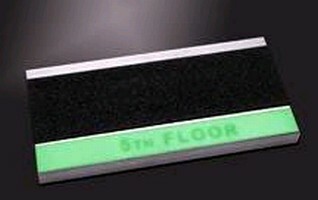 Sure-Foot Industries manufactures the Glow-in-the-Dark Message Tread to strict tolerances using top-grade materials. The tread is constructed with an aluminum base and coated with an anti-slip epoxy filler, a closed-celled material that will not trap dirt and oils, making it easier to clean and maintain. The resulting product is extremely wear-resistant even in high-traffic areas, and because it is also chemical-resistant and UV-safe, it is superior to vinyl- and rubber- based products. "Our Boldstep Glow-in-the-Dark Message Tread is a highly efficient product that reduces the cost of replacement and maintenance because of its durable construction," said Brian Haas, national sales manager for Sure-Foot Industries Corp. 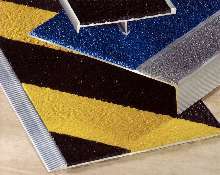 The Message Tread can be used for renovations and new construction. 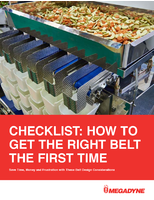 Each tread comes pre-drilled and ready to use. The treads can be easily attached to existing stairs and anchored on cement, steel or wood surfaces. They are available in widths ranging from three-quarters of an inch to 11 inches, and in lengths up to 12 feet. The Message Tread is rechargeable from any light source and provides over 20 hours of glow protection in the event of a power outage. According to preliminary tests conducted by the University of Georgia, Sure-Foot's Glow-in-the-Dark Message Tread emits over four times the required amount of photoluminescent light as established by the American Society for Testing Materials (ASTM). It also meets Occupational Safety and Health Administration (OSHA) and the Americans with Disabilities Act (ADA) requirements. The Message Tread also exceeds the stricter specification mandated by New York Local Law 26 by more than doubling the required amount of emitted photoluminescent light. For more information on Sure-Foot® products or to receive a high resolution image of the above photo, please contact Kaitlin Masseria at the number below.